Heat oven to 375°F. Spray cookie sheet with cooking spray. In small bowl, mix cream cheese, lime peel, cilantro and lime juice until well blended; set aside. Carefully remove stems from chiles; cut each in half lengthwise. * Remove and discard seeds. Unroll dough on cutting board; separate into 8 triangles. From center of longest side to opposite point, cut each triangle in half, making 16 triangles. 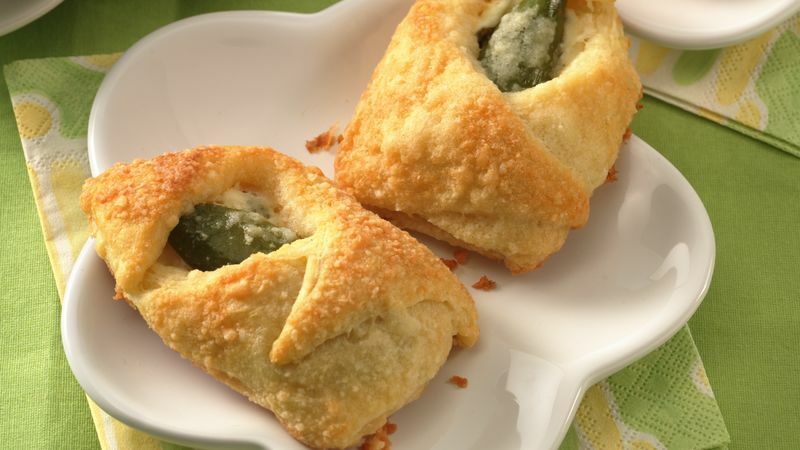 For each appetizer, spoon 1 teaspoon cream cheese mixture into chile half; place chile, cream cheese side down, on dough triangle with point of chile near top point of triangle. Wrap sides of triangle up over chile; pinch to seal. Bring point of triangle down over end of chile to cover; pinch to seal. In separate shallow dishes, place melted butter and Parmesan cheese. Dip each dough-wrapped chile into butter; roll in cheese to coat. Place on sprayed cookie sheet. Bake at 375°F. for 10 to 15 minutes or until golden brown. Immediately remove from cookie sheet. Serve warm. *Handle jalapeño chiles carefully, as their oil can cause burning. If possible, use food-safe plastic gloves when working with the chiles.